Not the Russell or Bird’s Celtics, the Jordan Bulls, the Duncan Spurs, Magic or Kobe’s Lakers. Never, by any team. To put that winning percentage in perspective that would be four straight Giant seasons of 129-33. Or the 49ers going 13-3 for 4 years in a row. Dynasty footnote here. No one loves and appreciates the Warriors more than me but its been six straight playoff years, four trips to the Finals and three titles. The 49ers had 16 straight years with 10 or more wins and five Super Bowls. Can we wait until the Warriors run is actually finished before we start tossing the D word around please? Nope. The new TV deal saw an enormous increase in the salary cap coming and the PLAYERS voted against gradually raising the cap, instead opting for a massive increase in a single off-season. Kevin Durant was a free agent that summer and the Warriors had managed their cap room perfectly to sign him. The NBA players union leadership made that decision, not the Warriors. The Warriors are somehow some super team thrown together. Nope. Steph Curry was drafted 7th. Klay Thompson 11th. Draymond Green 35th. Andre Igoudola was acquired in a sign and trade. Kevon Looney drafted, Jordan Bell drafted, Pat McCaw drafted. Shaun Livingston was not pursued by other teams initially. Yes, Kevin Durant was signed as a free agent. But this is not a team of top five lottery picks at all. Or a group of mega free agents coming together. Can you imagine having a golf tournament, a poker tournament, an auto race, a fishing tournament, or a soccer tournament where you just invited 16 contestants based on geography rather than ability?? Makes zero sense. The NBA has decided that 16 teams should be in the playoffs and that 4 series of 7 games are needed to determine that title winner. Both excellent decisions. But then it invites 16 teams with eight qualifying from conferences just based on geography instead of taking the best 16 teams. And then doesn’t seed the teams 1-16. This outdated and antiquated system needs to be torched immediately. Two items are trotted out and only a few real NBA followers challenge these odd statements. No pro sport plays a balanced schedule. The Giants play 19 games against teams in their division. The Niners play six of their 16 against three divisional opponents. The Eastern Conference has been weaker than the West for 20 years and counting. That is more than a trend. If an Eastern team plays 52 games in a weaker conference and STILL can’t have one of the top 16 records, they have proven beyond any doubt that they don’t belong in the playoffs. Whatever decade the East becomes better the system of taking the top 16 records automatically corrects itself. Just as an aside, Denver would have been in this year and Washington out. Not some dramatic overall at all. Just fairness. Really? 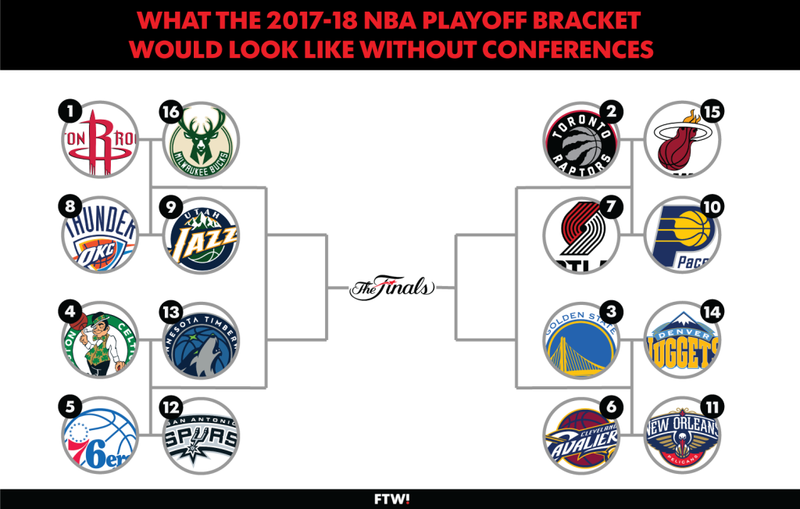 The Warriors would have played Denver, Cleveland, Toronto and Houston. Instead of San Antonio, New Orleans, Houston and Cleveland. What would have been the major difference is that the Warriors would have played Cleveland in the SECOND round, not the NBA Finals. Just look at the real bracket below. And I don’t think the other second round series, Houston/OKC, Boston/Philly, or Toronto/Portland indicates any type of crazy increased travel either. And if the league is so worried about travel, let the higher seed choose whether they want a 2-3-2 format or 2-2-1-1-1. If you get some crazy Warrior/Miami series I’m sure Steve Kerr elects to fly to Miami only one time. 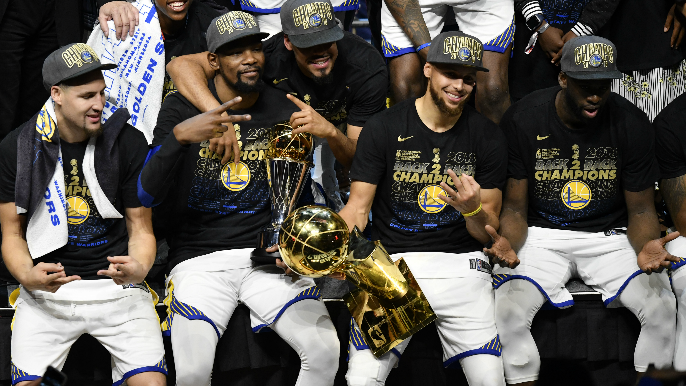 The bottom line is that Warriors excellence is creating all types of storylines within the NBA. All of them are interesting, spur discussion and hopefully improve a league that does so much right currently, both on and off the court. As far as the Warriors run? It might be only half way done.